A one week intensive June 10-14 meeting each evening from 7-8:15pm in St Louis Park. No audition required. Open to advanced middle school and high school students. Openings are limited. Register by May 20th. Participation fee is $100. No Limits Youth Brass Choir is an all brass ensemble comprised of Trumpets, Horns, Trombones, Euphoniums, and Tubas. No Limits now offers two levels of ensembles: No Limits 1, a select auditioned ensemble of 8 trumpets, 4 horns, 3 trombones, euphonium, and 1-3 tubas and No Limits 2, a non-auditioned ensemble with more flexible instrumentation. Past repertoire for No Limits 1 has included Beethoven Symphony No. 5, Pictures at an Exhibition, William Tell Overture, 1812 Overture, Tchaikovsky's Romeo and Juliet, Bizet's Carmen, Egmont Overture, and many other great orchestral works. This season No Limits 1 has performed Finlandia, the 4th movement of Beethoven's 5th Symphony, and will be performing Pictures at an Exhibition at their May 19th concert. No Limits 2 will be performing a Suite from Susato's Dansyre along with a joint performance of March to the Scaffold from Berlioz's Symphony Fantastique. No Limits 1 rehearses Sunday evenings 5-6:30pm at Wooddale Lutheran 4003 Wooddale Ave S in St Louis Park. No Limits 2 rehearses Sunday afternoon 4-4:45pm also at Wooddale Lutheran. No Limits also offers a summer session June 10-13 7-8:15pm. Summer session tuition is $100 and the ensemble will be performing Handel's "Music for the Royal Fireworks." No audition is necessary for summer brass. 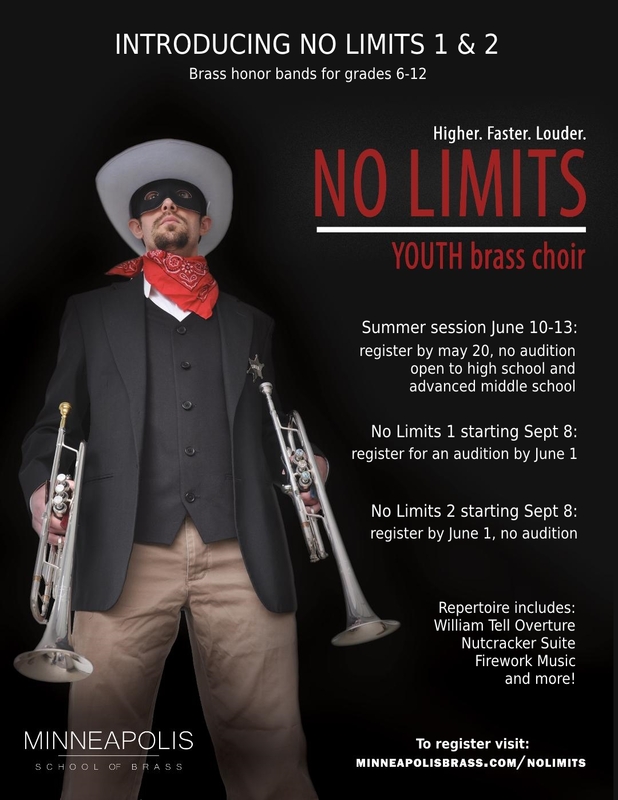 Audition registration is now open until June 1st for No Limits 1 for the 2019-2020 season. Openings are available in all sections and audition excerpts are now available. Register below to receive your audition packet. Auditions will take place the week of June 3rd. Repertoire will include William Tell Overture, Nutcracker Suite, St Paul's Suite by Holst, and others. Registration for No Limits 2 is now open until June 1st for 2019-2020. No audition is required. Register below to become a member of No Limits 2. No Limits 2 members should have command of a 2 octave chromatic scale and be able to play in concert Bb, Eb, Ab, F, and C major.